Raquel Meseguer's 'A Crash Course in Cloudspotting (the subversive act of horizontality)'. Photo by Matthew Cawrey. I visited the Southbank Centre in September for their Unlimited festival, a biennial art programme based on the work commissioned through Unlimited. Showcasing the best disabled talent across all art forms, from live performances to visual art, music and literature, Unlimited far exceeded the contemporary trend of socially engaged art practices. Bold and thought-provoking, the presented works prompted participation on different degrees, inviting the audience to step outside a mundane mass reality and into the complexity of social constructions. An ode to diversity, an exaltation of subjectivity. The festival presented different micro-realities, various personal experiences made universal through ingenious artistic endeavours, allowing audience members to empathise, identify and bond at multiple levels. My Dirty Secret, an installation by Kristina Veasey, is a sweep into most women’s nerve-racking torment: housework. Born from Veasey’s frustration as a disabled person battling with housekeeping, the immersive domestic environment intensifies with kaleidoscopic patterns across curtains, walls, cushions and a table. The unique décor, which by far resembles a funky 70s atmosphere, is instead a carnival of assembled images of common household detritus and grime. Greasy sink plugholes are repeated in mirrored images with food wrapper, a mouldy drinking glass and outdated chocolate tins. The private domestic chaos is magnified in the gallery space, absorbing the viewer into feisty motifs with the invitation to relax in the armchair, sit at the table, open the mail or answer the phone. A video BSL-interpreted repeats the mantra “it’s more important to live than clean” while the artist intermittently performs her presence within the installation, inhabiting the space, willing to interact with audience members. Veasey’s work brings the private to the public, beginning in the isolation of her private house to eventually evolve into various public spaces beyond the mere aesthetic of the exhibition; a version of her installation will soon be an actual room within an art hotel and a virtual one is available to navigate online. Contrarily, the work of Raquel Meseguer points directly to the etiquette of our so-called public spaces, particularly when private needs show up. Whom are those spaces for and who do they really serve? The audio-visual installation A Crash Course in Cloudspotting (the subversive act of horizontality), is a safe space wherein the audience is invited to partake in the subversive act of lying down in public while exploring chronic pain experiences and identities in illness. 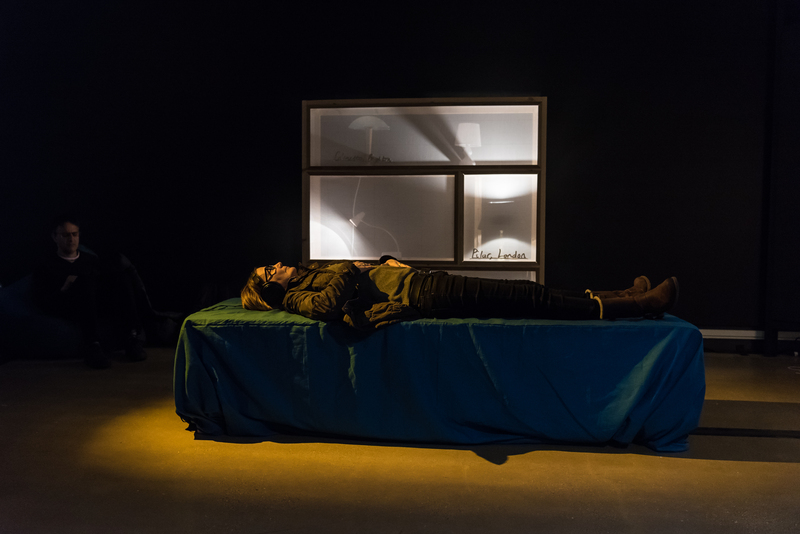 In a dimly lit environment with bean bags and a bed, the audience is encouraged to listen to seven stories collected in Autumn 2017 about people’s attempts to rest in public. ‘Toilet Floors’, ‘Train Stations’, ’Less in the world’ or ‘3.5 Hours’ are a poignant evidence of embarrassment and shame. In the installation, three lamps named Abbie, Colinetto and Pilar, act like avatars of real people: they light up when someone with a hidden impairment is actually resting in real time due to pain or fatigue. Their presence is made palpable within the space, and through the lighting, we can finally see them. By showing the different points of view and behaviours of people who might seem like everybody else, Meseguer challenges the ethics of public spaces inviting to reimagine them in a way which serves more people. The act of pausing and slowing down, hardly accepted in a society of fast capitalism, is channeled and sublimated through Meseguer’s intentions. Breaking down preconceptions, her work demands you to consider your own position, urging for less easy judgments and more pondered speculations. Her aesthetic of rest offers counter-culture narratives that shed light on the complexity of issues such as antihomelessness measures or inclusive work policies. The social engagement in both Veasey’s and Meseguer’s practices is rooted in the very nature of their artistic urgency. Meseguer is also the founder of the Resting Spaces Network Project, who asks theatres, galleries and other arts venues to provide resting spaces for people in need, particularly when those spaces are technically closed to the public. Their ambition is to develop a nationwide app showing resting spaces never more than half an hour from the person in need. How constructive would it be, in a fast-paced metropolis like London for instance, to relinquish gravity for a while and welcome horizontality. Veasey and Meseguer drive to go beyond the mere exhibition of artworks, to challenge common conventions and have a real impact on people’s lives through various levels of immersion and strategies to participate is the real social output of both works. The revolutionary aspect of their practices, which affect beyond any disability issue, resides in the inherent radical ethos to mitigate social divide and instigate collective change; underlining the truth that sooner or later, everyone of us will benefit from the ability to sincerely empathise. Kristina Veasey – My Dirty Secret!